Facts and information about the History of Clothing and regalia of Native American Indians and their Moccasins. The customary shoes worn by American Native Indian tribes were called moccasins, a name that originated from the Algonquin word 'makisin'. 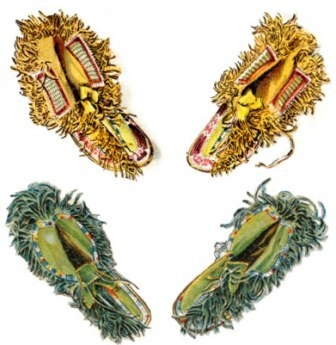 The color, style and design of moccasins varied from tribe to tribe, as did the materials they were made from. Traditional moccasins were shoes made of deerskin, or other soft leather, the sole and upper part being one piece. They were sewn and secured by strong sinew or buckskin. Additional interesting information and facts, together with pictures of moccasins, are described in this article.